Cooking experiences are some of our most popular experience days and we especially like ones which focus on specific dishes, like the bread making experiences, chocolate experiences and these pasta making experiences. Isn’t regular dried pasta just as good? The people who sell dried pasta keep telling you that, but once you’ve made and tasted your own fresh pasta, you’ll never buy the dried stuff again. So now’s your chance to see what you were missing – there’s bound to be pasta making courses near you, so check them all out! Or save yourself the trouble and treat yourself to our most popular experience in the panel above. Haha!! Neither can Jamie Oliver and a lot of the top chefs, but they all manage to make magnificent fresh pasta, and after your pasta class, so will you! You’ll be surprised just how easy it is, and just how few ingredients you need. 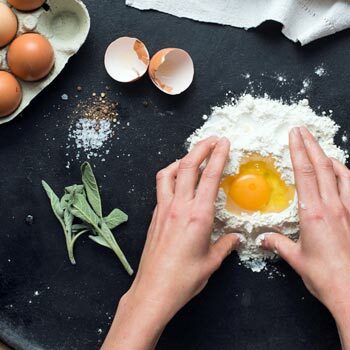 The right flour is the main secret – then, you just add eggs and olive oil and mix and knead it until your pasta dough is just the right consistency. Once you get the technique and know what to look for in a perfect dough, you’ve cracked it. You’ll be shown pasta machines (a bit like an old-fashioned mangle that your granny used to use for the washing) and how to use them to make pasta sheets, spaghetti and the other many and varied forms of this lovely Italian staple. This Christmas (or birthday, or other celebration day) give your loved ones something they’ll really enjoy, appreciate and come to treasure! Send them on. a pasta making experience – or even better, go with them and make it a double event. Learning a new and essential skill like this is the gift that keeps on giving!! !